Summer entertaining is a favorite of mine. The backyard is blooming and I am ready to have friends over. Brunch is a perfect meal to serve on the weekend. I love a lazy Sunday gathering and the easiest way to make sure it stays lazy is to make it a potluck! Invite friends over and ask them to bring their favorite dish (every Southerner has one and it’s usually a casserole). I tell everyone, I have cocktails and dessert y’all bring the rest! 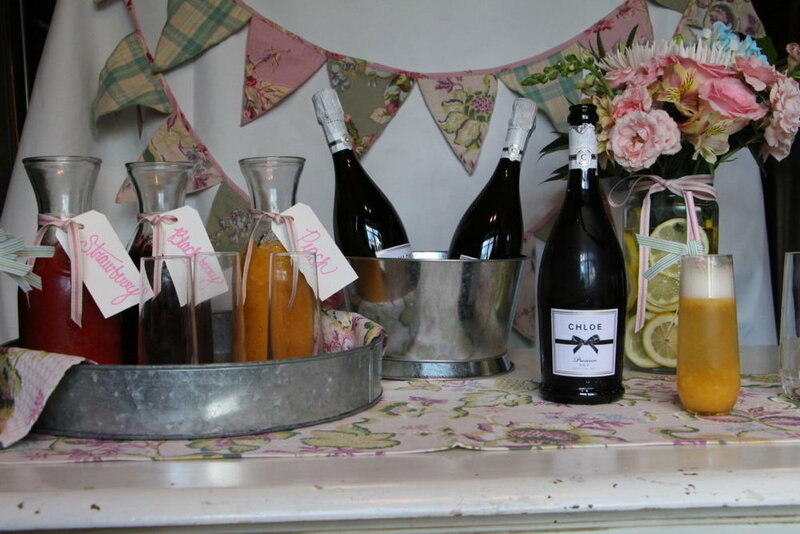 Brunch isn’t complete without a cocktail to sip on and what is more delightful than some bubbly? Mimosas are good but if you want to up your signature cocktail game, a Bellini is the way to go. 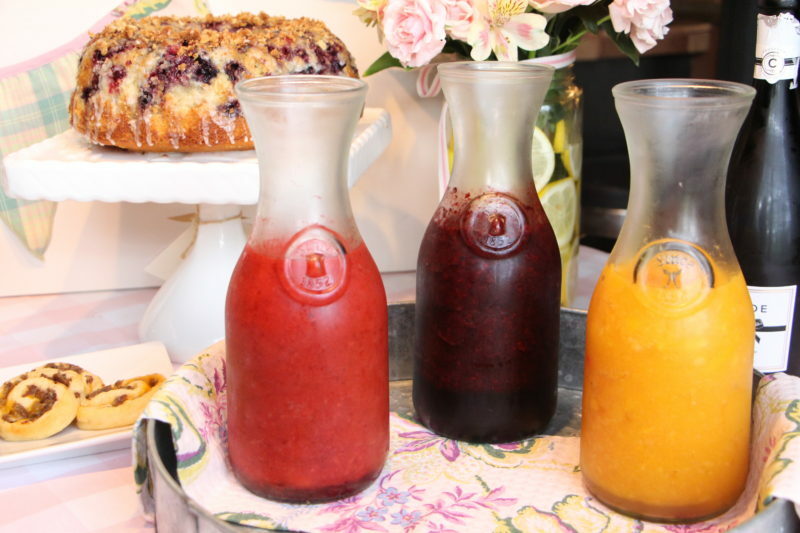 Traditionally, the Bellini is made with peach puree and topped with Prosecco but I like to offer a couple of additional options for my guests. Blackberry and Strawberry are always crowd favorites and when the peaches come in around July 4th it makes the menu for sure too. I also think a cute straw makes it taste so much better, don’t you? 1 bag frozen fruit with 1 T of agave nectar and 1 cup water. Pulse in Cuisinart until smooth and pour in serving container. Pour (or spoon) fruit in champagne glass about ¼ full and top with Prosecco then garnish with a straw and fruit. Preheat oven to 350 degrees. Prepare mini Bundt pan with butter and coat with flour. Set aside. Cream together butter and sugar, add eggs one at a time and add vanilla.In separate bowl combine flour and baking powder. Add 1/3 flour mixture and ½ of the milk to butter and sugar mixture, mix well and add the rest of flour and milk making sure batter is combined well. Mix peaches, cinnamon and brown sugar in small bowl and let sit for 5 minutes. Pour some cake batter in each mold and then add a layer of peaches then top with batter. Bake for about 25 minutes or until center springs back when you touch it. Take out and let cool for 10 minutes and flip over on cooling rack. Let them cool for 15 more minutes then add glaze. Bring brown sugar, milk and butter to a boil over medium-high heat for 1-2 minutes. Remove from heat and add powdered sugar and vanilla. Mix with electric mixer until smooth. Drizzle on mini Bundt cakes immediately. Preheat oven to 350 degrees. Coat Bundt pan with butter and dust with flour. Cream butter and sugar together then add vanilla and eggs (one at a time). Mix flour, baking powder, baking soda, and salt in a separate bowl. Slowly add the flour mixture and buttermilk, (alternating) with mixer on low until everything is well combined. Add half of the blueberries and carefully turn into cake batter. Pour batter into cake pan and top with the rest of blueberries. Bake for 60 – 70 minutes or until a toothpick inserted into the center comes out clean. Let cake cool for 30 minutes before flipping on cooling rack. Do not flip too early or you will have a mess on your hands. Touch the bottom of the cake pan and if it is still hot to the touch, let the cake cool a little longer. While cake is cooling, add all ingredients to small bowl and blend with fingers. Sprinkle mixture in small pieces on parchment paper lined baking sheet and bake at 350 degrees for 7-9 minutes or until golden brown. Cool on baking sheet while you prepare the glaze. Whisk buttermilk and powdered sugar together until smooth. 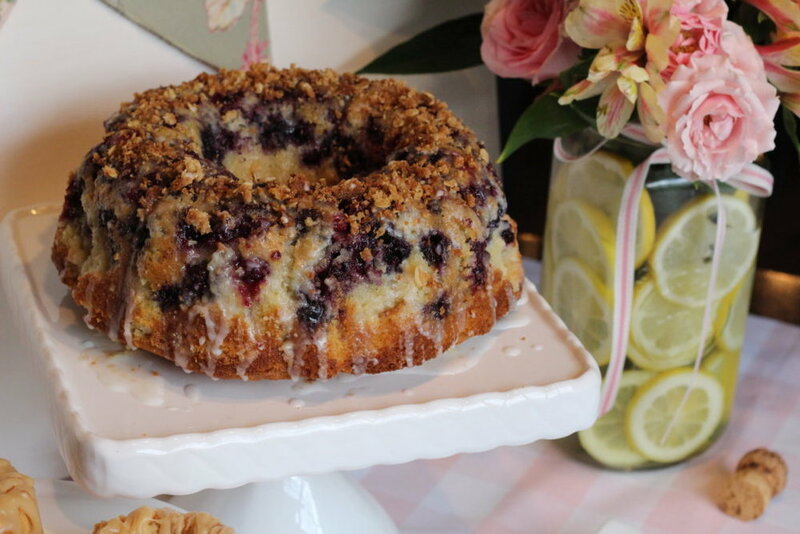 Drizzle glaze over cake and immediately sprinkle the crumble on top of cake before glaze hardens. I keep the décor simple with a couple of flower arrangements in oversized mason jars and sliced lemons to add a punch of color. I used an April Cornell table runner and matching bunting to bring some color and pattern to one of the tables and some leftover fabric from a project on the other table. Cheers to warmer weather and sipping a Bellini on the porch! What’s your favorite way to entertain for brunch? Join the party! Sign up for our monthly newsletter.